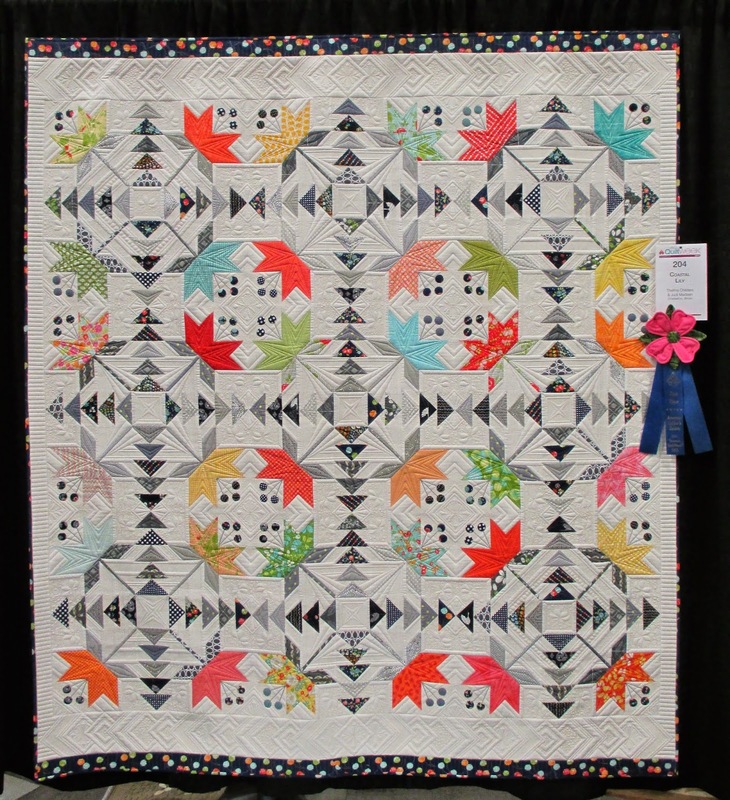 First Place - Bed Quilts - Longarm Machine Quilted Category. Even though this is the third quilt that Judi Madsen , Green Fairy Quilts, and I worked on together, and the third quilt juried into the AQS Show in Paducah, this is our first win (Two Score and Seven Stars and Evening Bloom were our first two entries). And interestingly enough, before the awards ceremony, Judi and I had never met in person. Judi was at the show to teach for the week, the day before the awards ceremony Judi texted me that we needed to meet and get our picture taken by Coastal Lily since we were both in town. I texted her that I would meet her on stage at the awards ceremony when we picked up our ribbon! And we did!! It was a wonderful moment, surreal really. Another wonderful moment was being greeted by Linda Hrcka and Lisa Bongean, who were on stage for winning second place in this category with their quilt Words To Live By. This is one happy group of quilters. 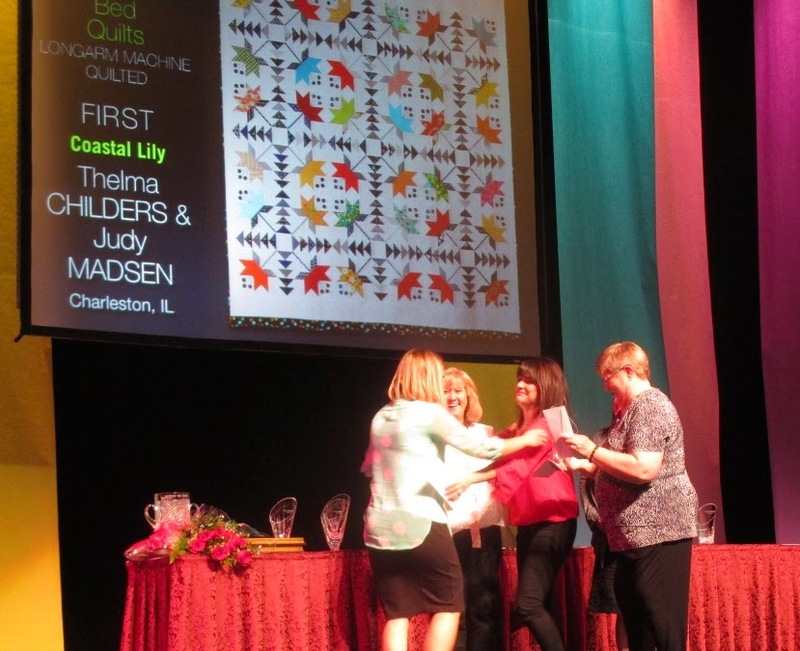 I was so busy taking pictures of Linda and Lisa on stage for their win that I didn't even see Coastal Lily pop up on the screen for winning first place. I just heard the announcement, squealed, and ran up on stage! It is really all a blur, luckily there were some other quilters taking pictures at the ceremony so I have these to remember and relive the moment. The winners are not notified in advance, you find out at the show that you're a winner, which makes for a crazy roller coaster of a time, lots of happy and surprised people. The ribbons at the Paducah Quilt Show are topped with their traditional homemade dogwood blossoms, the colors vary, but how perfect Coastal Lily adorned this pink bloom, my favorite color! I love dogwood trees and they were blooming everywhere in the trees lining the road on my drive down to the show. I appreciated those blooms even more on the drive back home. That has got to be the best ribbon at any show. 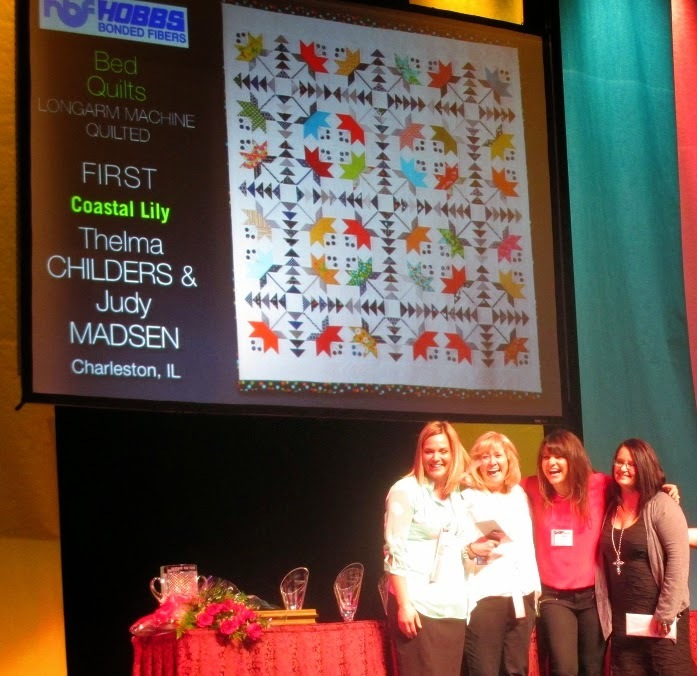 So here is Coastal Lily on display at the convention center with it's fellow Bed - Longarm Quilting winners. Words to Live By, which won second, is on the left, designed and pieced by Lisa Bongean of Primitive Gatherings and quilted by Linda Hrcka from the Quilted Pineapple. On the right is Vintage Moments which won third place and is pieced by Jan Zimmerman using the pattern Vintage Moments by Marsha McCluskey and quilted by Jan Hutchison. It was fun watching the different reactions to the quilts from folks attending the show. Some were drawn to the reproduction feel of Words To Live By, others went right up to Vintage Moments saying "I love 30's fabrics". But what a nice assortment of winners, something for every taste. I think the colors of Coastal Lily caught everyone's eye first thing, but it's the quilting, that creates a secondary pattern within the quilt, that really brings that top to life. It was as if folks would look at the blooms then notice the quilting, then be in awe of the accuracy and creativity of how Judi quilted this top. This is the pattern that started it all. 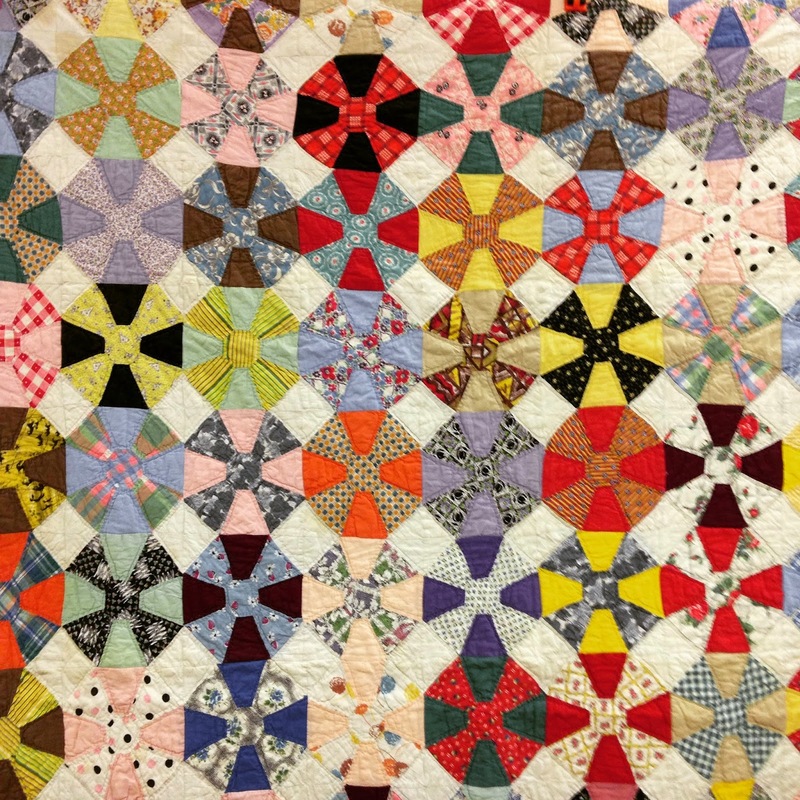 Some people think that quilts entered into the show must be an original work, but quilts made from patterns are allowed, as long as the designer grants permission for the quilt to be displayed in the show. Laurie Simpson could not have been nicer and happily gave her permission for Coastal Lily to be entered for consideration into the show. Whenever I was asked at the show if a picture of our quilt could be posted on social media I said yes, as long as Judi was given credit for the quilting and Minick & Simpson credit for the pattern. I hope that happens, because even though Minick & Simpson were not on stage with us, they sure had a hand in the win, a good group effort. 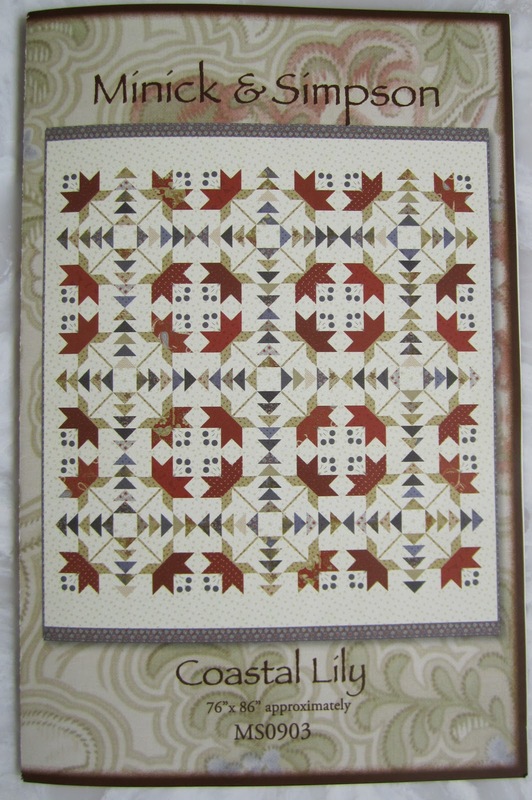 Additionally, AQS provides the quilter's names and pattern information in the show book for each quilt. The Costal Lily pattern is still available for purchase here. Judi and I were asked to go back to the Convention Center at 5 am the morning following the awards ceremony for a live TV interview with the local NBC affiliate. My first time on TV, let alone live TV, but it was fun. The AQS staff does such a good job of running the show. I really appreciated their help navigating the expectations and responsibilities of being a winner. 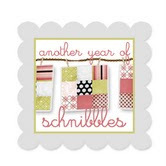 To all the quilters who did stop by Coastal Lily at the show, thanks for your kind words. When I was hanging out by the quilt I met several folks in person, which was even more fun. I enjoyed talking to all the quilters. I think I may have even planted a few seeds about entering their quilts in future shows. You do not need to be a professionals quilter, a teacher, pattern or book writer to be in the quilt show, I'm a testament to that. Like I always say, quilting is my hobby, not my job. I'm just like you, which means you can have quilt in this show too, please give it a try. Quilts juried into the show came from all 50 states and 10 countries for a total of 404 entries. For the US the state of Illinois, where I live, had the most entries, 25, California was second with 24. There were 63 entires from Japan. 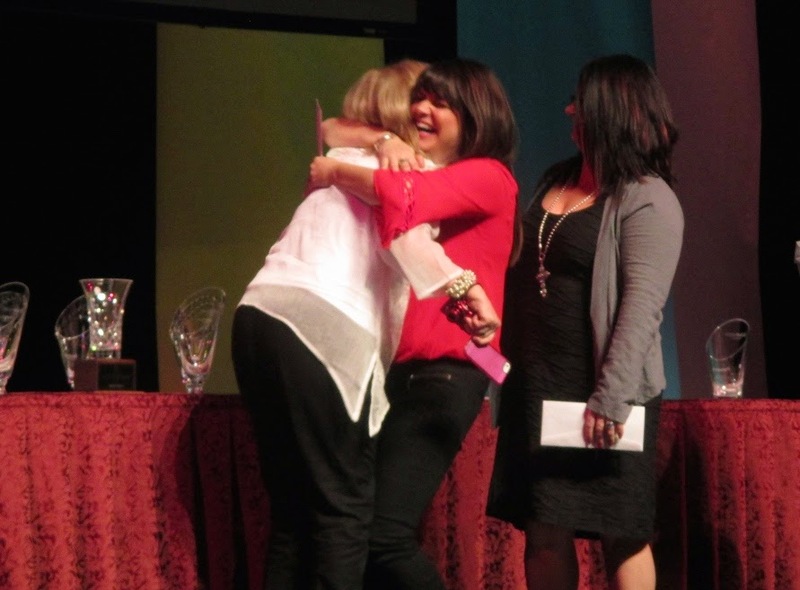 My favorite picture of all, Linda greeting me on stage where she could not be happier. And look, I'm still carrying my phone and camera that I was using to take pictures of them for their win. Last year Linda, Lisa and I won Honorable Mention for Door County Cherry Baskets and Lisa and Linda won first place for Portland Rose. I didn't think I could top the joy and excitement of the 2014 Paducah Quilt Show but I did. Winning was wonderful, but sharing the experience with friends, new and old, made it even more special, a night I'll never forget. I am truly honored and humbled by the whole experience. 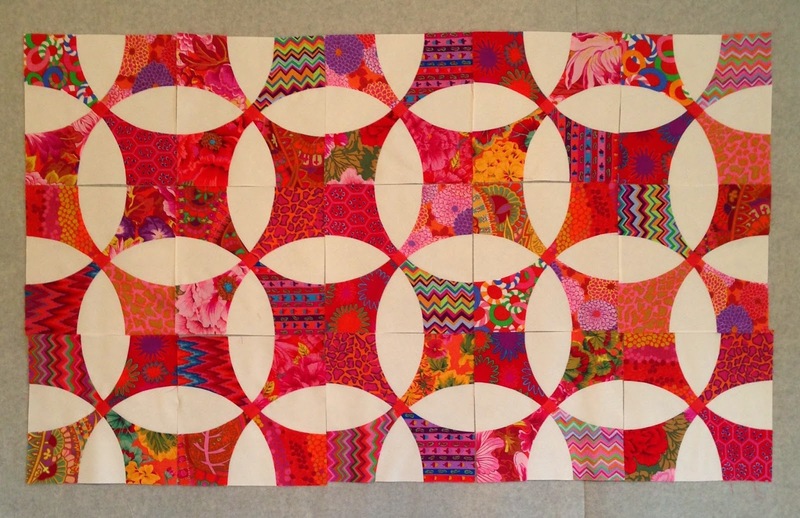 My Kaffe Fassett Flowering Snowball quilt is "in the books". "Put it n the books" is what my husband says to me whenever his favorite baseball team wins. I think the announcers say it too. Sometimes I get a text that says, " put it in the books", that tells me two things, his team won and he'll be in a good mood. Sometimes I love baseball season, sometimes I don't. Baseball season officially started last week, it's a very long season, figuratively and literally. But back to this beauty! I'm not adding a border, I like it just like this. I guess I've named this quilt Kaffe Fassett Flowering Snowball. It finished at 57" x 64"
It has approximately 378 pieces. I used all the prints except two and added 6 more that I purchased online. I enjoyed working with this fabric and having a family of fabric to get me started was a big help. I think the thing that fascinated me the most were the big prints, prints I would probably pass on if I saw them in a store because they were so big. But I used the big prints in the roll and was amazed how different they looked when they were cut up. In the quilt they sometimes look like they are from different prints instead of the same print. I'll be more open minded about using large prints for smallish blocks in the future. 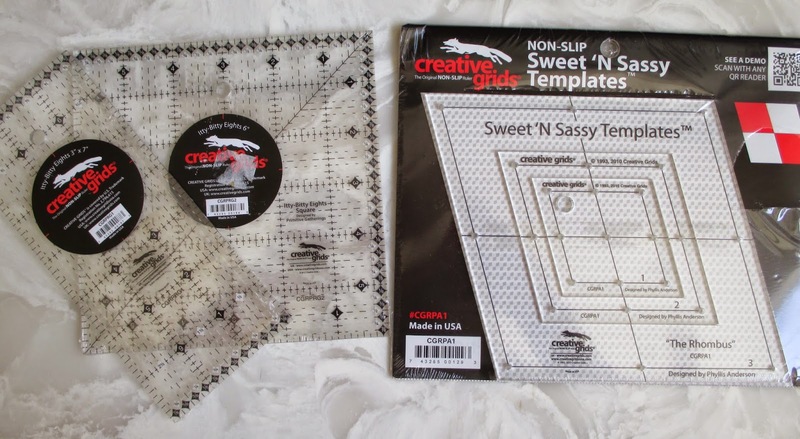 This is the template set I used for my blocks. It worked great and I would recommend it. 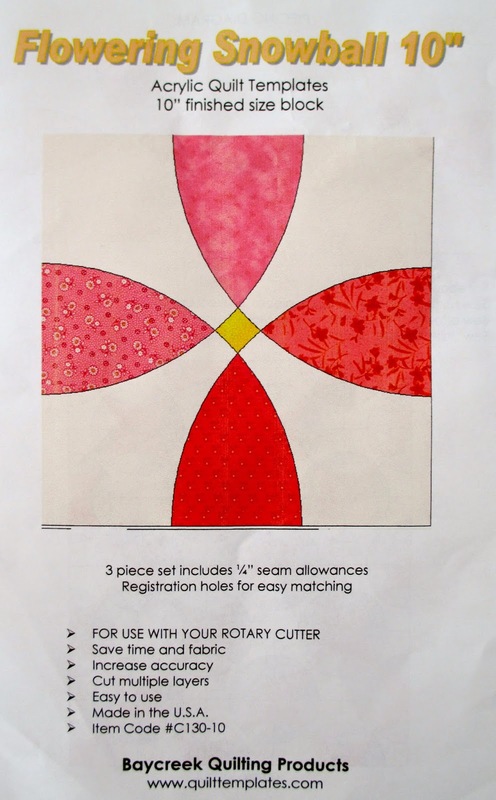 Baycreek Quilting Products has different size options for this block and several other templates. So I worked with new templates, sewed curved pieces, and used fabric outside my normal milieu, what an adventure! 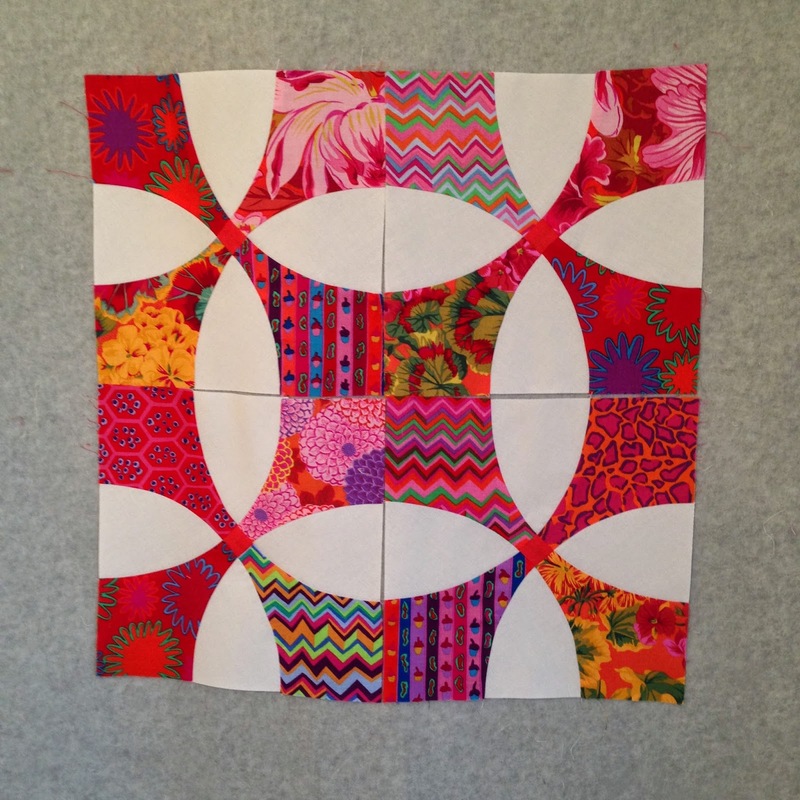 I have decided for sure that this will not be my last project using Kaffe Fassett fabric. Are you ready for a new Snapshots block? It's that time again!! It nearly snuck up on me, I made my block over the weekend. This month's pattern, Block Four, is Puppy Love, my latest favorite. I made a few changes to my block. 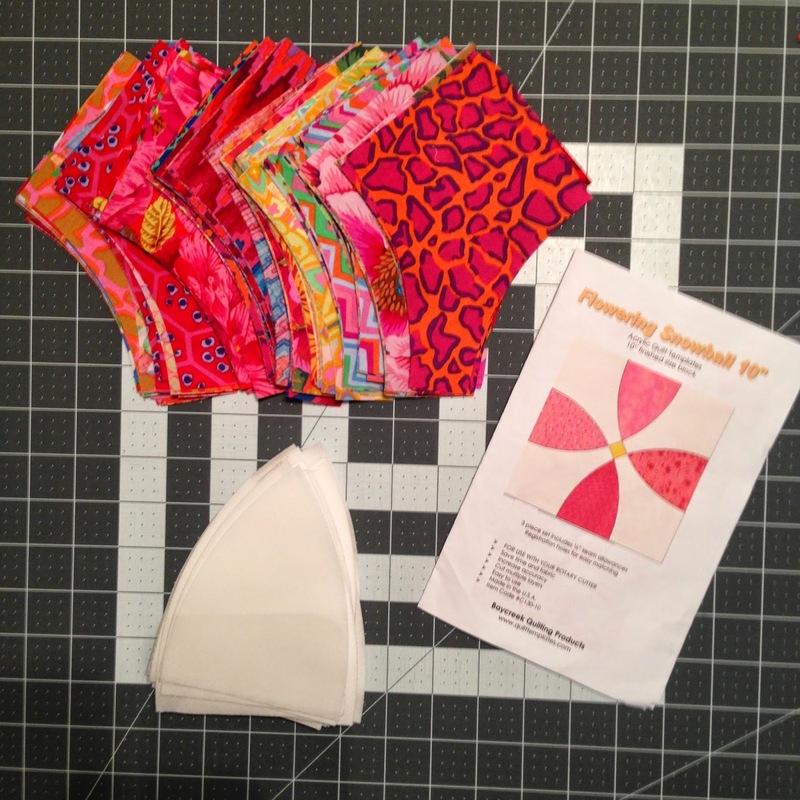 I used the Puppy Love fabric to make my sewing machine, block two, so I needed to select different fabric. I really liked the basket print so I just used a different color way. And since my puppy is a boy, I went with a blue bow. I also exchanged the puppy fabric for a beige and white dottie print from my stash, that matched my puppy a little better. Also, my puppy has a big brown nose and brown eyes, so I used some brown stash fabric for those. The pattern was very easy to follow, the easiest block so far, it only took me a couple of hours to cut and piece this block. I played around with the eyes some, the pattern calls for buttons, I went with some fabric circles using the Kay Buckley Perfect Circles, but coming up with the perfect size took a couple of tries. Four blocks done, 8 more to go. This is my Puppy Love model, Cooper. Here are a few more folks participating in the sew along, be sure to check out their puppies. And finally, be sure to also check out instagram, #fqssnapshots for some great blocks and inspiration, the tea pots were amazing! Here's my April quilt of the month, Lifetime Quilt #140. I just got this quilt back from the quilter and was so pleased with it I immediately hung it up. The fabric is Persimmon by BasicGrey for Moda. The pattern is Metro Lattice by Sew Kind of Wonderful. I didn't add the lattice, lol. I don't know if that Persimmon line is a spring fabric but I love it and think it works for April, especially since we've not had much of a spring yet. (click here for more details about LQ#140) I know some quilters think using a family of fabric is sort of cheating, and I sometimes add a few pieces from my stash when I work with a family of fabric to make it more my own, but this quilt is all Persimmon, and I wouldn't change a thing. The Fat Quarter Shop still has a few pieces of this fabric left in their inventory. They also have charm packs and Jolly bars. 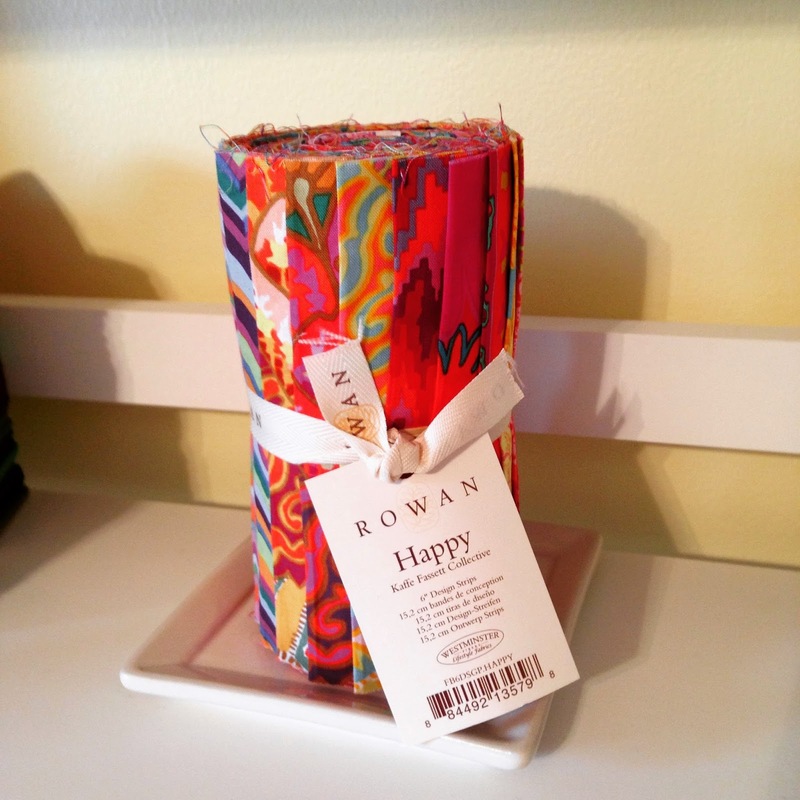 For less than $20 you could make something really cool using this fabric and a jolly bar! 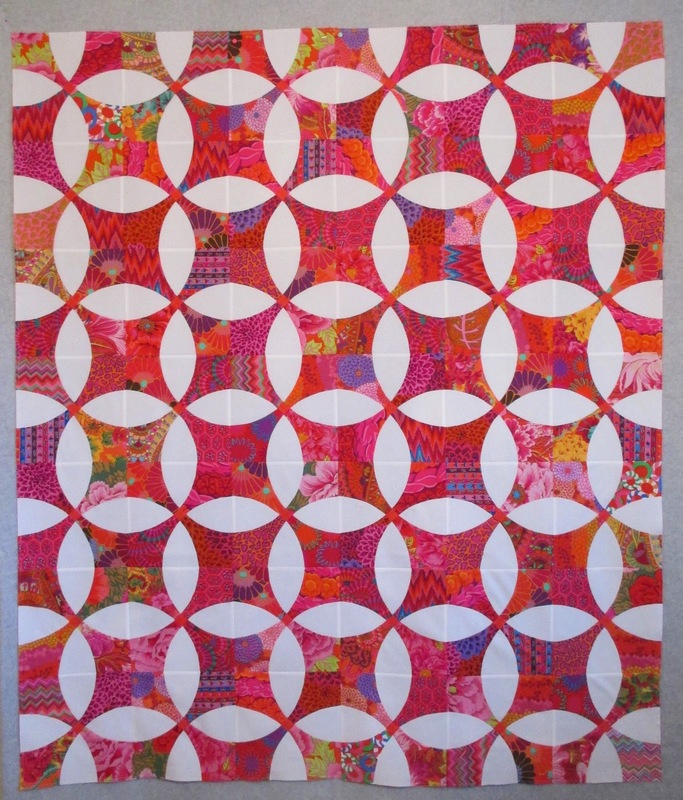 This quilt was wonderfully quilted by Connie Lancaster at Quilts Plus in Indianapolis, IN. I seem to have a circle theme going here. My Kaffe Fassett Flowering Snowball is progressing nicely. The blocks are really easy to piece. I'm keeping my fingers crossed that all the pieces line up perfectly when I sew my blocks into rows. Right now I'm really not paying much attention to my fabric placement, I just don't want two like fabrics touching (that's against the law you know). For those of you who left comments saying you too were overwhelmed by selecting Kaffe Fassett fabric, look for a bundle like I'm using, it gives you such a great start. I've eliminated two prints from the roll and selected 6 other prints online to add to the mix. It's wild but I'm still liking it. And finally, summer is a hectic time of year around our house. It seems we are on the go more, after hibernating all winter we're usually up for anything going on outside the house for a change of pace. 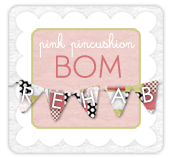 Since I don't spend as much time in my sewing room I thought maybe a hand project would be a nice way to fill the few extra minutes I do have here and there throughout the day and the time in the car. 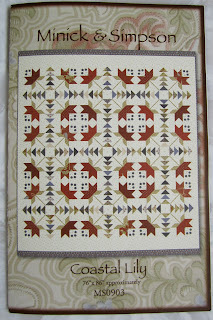 I've decided to try this Sue Daley pattern called Gathering Pieces. It finishes at 54" x 54"
Instead of going with a white background like the pattern, I'm using the orange dot from Happy Go Lucky by Bonnie and Camille for Moda. I'm also using the navy truffula tree print from Happy Go Lucky for the outer border. I wanted a project that felt like summer and I think this fits the bill. Only 216 more orange octagons to go! Truffula tree, from the Dr Seuss book The Lorax, don't those look like truffula trees to you?